A high profile Bahrain business delegation, led by Mr. Khalid Al Rumaihi, Chief Executive of the Economic Development Board (EDB), visited Germany in May 2015 to participate in the prestigious Transport Logistic event held in Munich, as part of Bahrain’s efforts to present the Kingdom’s key competitive advantages to international investors, particularly in the Logistics sector. Given its strategic location in the GCC, Bahrain has long been considered the gateway to the region with easy access to the Kingdom of Saudi Arabia, Kuwait, Qatar, the United Arab Emirates, and Bahrain continues to make substantial investments in its modern logistics infrastructure to capitalise on the projected growth opportunities in the regional economy. In 2014, the logistics sector contributed 7% to the Kingdom’s real Gross Domestic Product (GDP) and as per statistics from the Central Informatics Organization (CIO), the annual growth rate of the Transport and Telecommunications industry reached 6.2% in 2014 highlighting the sector’s strong economic performance in recent years. This growth has been supported by Bahrain’s business environment, which has been recognised for its openness – Bahrain currently ranks 18th freest economy in the world, and first in the MENA region the Heritage Foundation’s Index of Economic Freedom – and is distinguished by its skilled national workforce, low operating and living costs, and competitive taxation system. This along, with the signing a Free Trade Agreement (FTA) with the United States of America, and through its role as a key player in enabling the GCC countries to sign FTAs with the EU, China, Japan, Iraq, and Australia, means that companies looking to expand into the region, and to trade internationally, are able to take advantage of the competitive advantages of the Kingdom. In addition to its competitive advantages, the Kingdom constantly looks to developing its industries and diversifying its economy, a process which has led Bahrain to become one of the most diversified economies in the region, with the Oil and Gas sector accounting for a fifth of the Kingdom’s GDP, compared to 44% in 2000. One of the key sectors that have contributed to this change is the logistics sector. Given the Kingdom’s size and proximity to the neighboring GCC countries, many companies, particularly in logistics, choose to base their operations out of Bahrain in order to access the GCC, and with the shortest travel time in the region between its seaport, airport, and the logistics processing zones, Bahrain enables efficient and fast processing of trade goods, offering the best value for money when it comes to operating costs. There are a number of noteworthy infrastructure facilities in the Kingdom, including the the $360m Khalifa Bin Salman Port, which started operations in April 2009 and has since offered world-class services to shipping lines, freight-forwarders and beneficial cargo owners facilitating growth for the local economy and enhancing supply chains for the Northern Gulf. Built in the northeast of Bahrain, it is only 13 km from Bahrain International Airport and is linked to Saudi Arabia by the King Fahd Causeway and Feeder vessels. The Khalifa Bin Salman Port has witnessed a great deal of success on account of new services connecting Bahrain to global markets, safety practices, operational excellence. 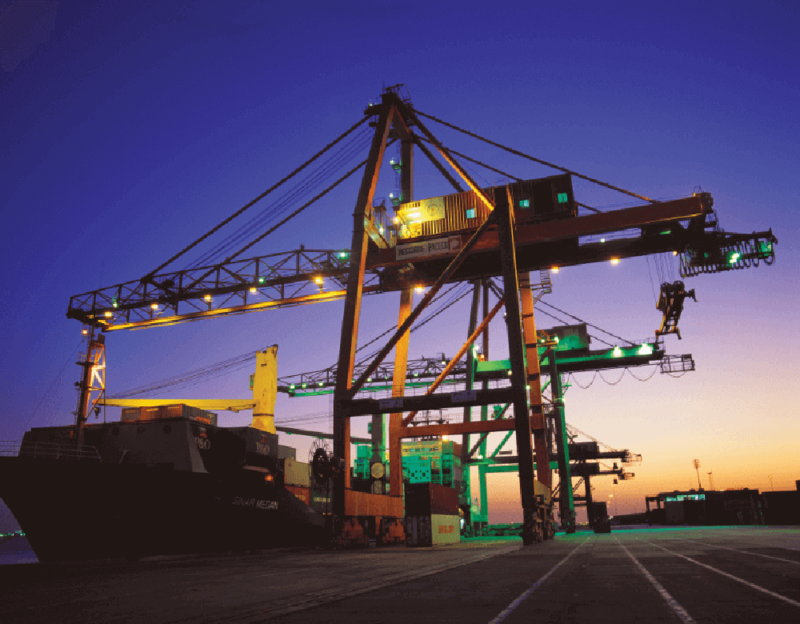 In a pioneering example of a public-private partnership, The Khalifa bin Salman Port is operated by APM Terminals Bahrain, which has a 25 year concession, and oversees the management and operations of the port. Bahrain International Airport (BIA) hosts 27 commercial airlines and 11 cargo airlines, and provides sophisticated facilities for logistics operators. Just 13 kms from two other key developments, the Bahrain Logistics Zone (BLZ) and the Khalifa Bin Salman Port, the airport offers access to Bahrain and the wider region. In terms of capacity, 322,734 tonnes of cargo can be carried a year and considerable expansion is in progress. In January 2011, the BAC signed an agreement with MENA Aerospace to build and operate one of the region’s largest private and general aviation hangar complexes in order to create an expanded cargo handling facility that would triple Bahrain’s international air cargo capacity to one million tonnes a year – comparable to London’s Heathrow Airport – with the ability to handle 27 large cargo planes at any time. According to BIA statistics, around 9 million passengers pass through the airport on average each year. In January 2014, Bahrain Airport Company signed a BD13 million agreement with Aeroport de Paris Ingénierie (ADPI) who will serve as design and engineering consultant on the Airport Modernisation Programme. This agreement is expected to elevate the airport’s infrastructure and services to a level whereby it can increase the airport’s capacity to 14 million passengers per year. An agreement was also signed with Chinese Shenzhen CIMC Tinda Co. Ltd to the tune of BD1.2 million for construction of seven new commuter bridges between the airport boarding gates and passenger planes. In January, a BD6.9 million agreement with Hill International to provide project management consultancy services for the Airport Modernisation Programme was also announced. Salman Industrial City opened in January 2010 and includes several key infrastructure projects in the Hidd area such as the Bahrain International Investment Park (BIIP), Bahrain Investment Wharf, and the Hidd industrial Zone. It is adjacent to the Khalifa bin Salman Port and is serviced by excellent infrastructure. BIIP is host to a number of leading international companies, including Mondelez International, MTQ Corporation, Abahsain Fiberglass, RMA Middle East, BASF, JBF and Siemens. The Land Transportation Directorate within the Ministry of Transportation and Telecommunications is responsible for public transport in the Kingdom of Bahrain. The Ministry is embarking on several projects that are aimed at improving the public transport system in the Kingdom, and has offered a tender for the appointment of a new operator to run the public transport network which includes the procurement of new buses, which was awarded to a joint venture by National Express and Bahraini conglomerate Ahmed Mansoor Al A’Ali, as well as other projects to modernise bus stations, ticketing systems, information systems, as well as the rehabilitation and development of the existing bus exchanges and depots. Launched in 2008, Bahrain Logistics Zone (BLZ) is the only dedicated Customs Bonded Area focused on value-added logistics in Bahrain. It is also the Middle East’s first multi-model logistics hub to focus on re-export and value-adding logistics. The Bahrain Logistics Zone, which is in close proximity to the Khalifa bin Salman port, has gained the attention of international logistics players and signed various leasing contracts. It was chosen by Almoayed Wilhelmsen, Aramex, Cargo Partners, Bandar Al-Khaleej-Bitu-Mena, and also Schmidt Middle East Logistics, who in December 2014 announced that building had begun on a $30 million dry bulk logistics hub in Bahrain. The facility will ultimately store around 30,000 metric tonnes of materials. In terms of infrastructure projects and roads, Bahrain has witnessed in recent years the development and implementation of a number of large-scale projects, and has pledged $694 million in ongoing investment to such projects, which included the reconstruction of the Sitra crossing which was completed in 2011, and the Shaikh Khalifa Bin Salman Highway, adjacent to Mina Salman intersection project. In August 2014, the Minister of Works, H.E. Engineer Essam bin Abdullah Khalaf, announced the Ministry’s plans to study the construction of a fourth causeway to link Muharraq and Manama. The Logistics sector has already attracted a number of leading international companies to establish headquarters in Bahrain in order to access the neighbouring GCC economies, including DHL, Aramex, KWE and Agility. With the announcement in 2014 of plans to invest $22 billion in key infrastructure projects over the coming years, across a range of sectors including transport, housing, manufacturing, energy, healthcare and education, further development is expected across a range of sectors, including the logistics sector.